One of the reasons why I love working for the paper and why I love photography is general is that I often get to capture people doing what they do best. There is something so hypnotizing and compelling about people when they are in their "zone." They are completely absorbed in their work, you can see it in their eyes, and you can hear in their voice. This guy was no exception. 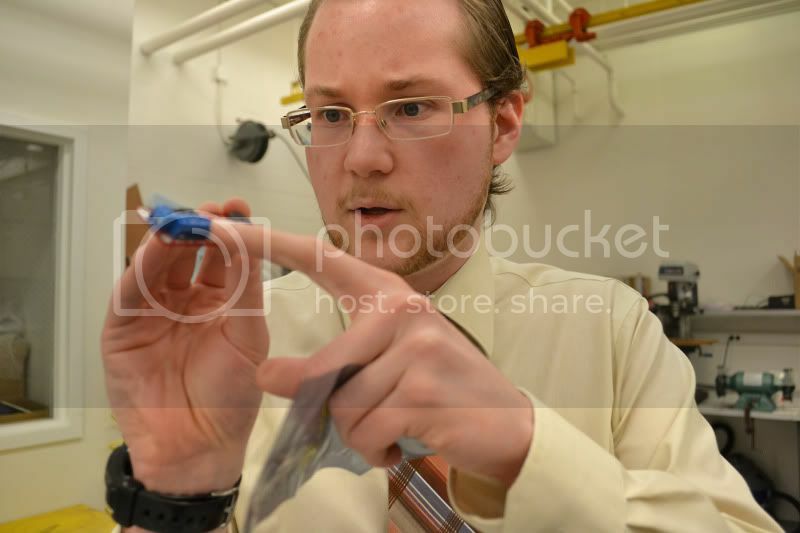 He is the project lead for the NASA University Student Launch Initiative (a national rocket building competition) at UW. The writer and I were being shown around the lab where the team built their rocket when I noticed the project lead was opening a package that contained a small chip which I suspected was for the rocket. Not knowing what the piece was, I asked, "What is that?" I wish you could have seen his reaction! He was so excited that I seemed interested in the project. All I could do was try my best to capture his excitement as he explained to me that the chip was an altimeter, a device that measures the altitude of the rocket and triggers the release of the parachute. Why did I chose this picture? Out of context, it's a pretty crappy picture. Ideally, the chip and his hands would be in focus. But how do you prepare for spontaneity? I never expected to get such a positive reaction from such a simple question.